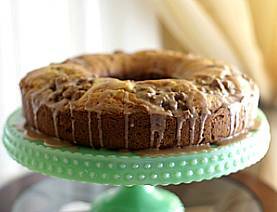 Instead of a crumbly streusel, this sour cream coffee cake gets a maple syrup "filling" chock full of walnuts. Serve with coffee or tea. Preheat oven to 350 degrees F/180 degrees C. Butter and flour a 9 or 10-cup bundt, tube or coffee cake pan. Tap out excess flour. Using fork, mix flour, butter and cinnamon in small bowl until crumbly. Stir in walnuts and maple syrup. (This will be a liquid streusel). Whisk flour, baking powder, baking soda and salt in medium bowl to blend. Using electric stand mixer and paddle attachment, beat sugar and butter in large until fluffy. Beat in eggs, one at a time. Mix in vanilla. Beat in flour mixture in two additions, alternating with sour cream, just until blended. Spoon half of batter into prepared pan. Spoon about two-thirds of maple filling over batter. Spread remaining batter over filling and smooth top. Dot with remaining filling. Bake until tester inserted near center of cake comes out clean, about 40 minutes. Transfer pan to rack and cool 15 minutes. Run knife around pan sides to loosen cake. Invert cake onto rack, then invert cake, streusel side up, onto platter. Sprinkle with confectioners' sugar when cool or drizzle with Cinnamon Glaze. In a small bowl, whisk together confectioners' sugar, milk and ground cinnamon. Drizzle over the cooled cake, letting it drip down the sides. Cake can be made up to 2 days ahead. Wrap in plastic and store at room temperature. This cake turned out delicious! Everyone in my family loved it.The only thing that I will change next time is to put some maple syrup (or maple cream) in the glaze and use less milk. Only because we enjoy the maple flavor so much.